Emily Holmes Coleman, The Shutter of Snow, The Viking Press, 1930. After bearing her first child, Marthe Gail has a nervous breakdown and begins to believe that she is Jesus Christ returned to earth as a woman. In a prose form as startling as its content, The Shutter of Snow portrays the post-partum psychosis of Marthe Gail, who after giving birth to her son, is committed to an insane asylum. Believing herself to be God, she maneuvers through an institutional world that is both sad and terrifying, echoing the worlds of One Flew Over the Cuckoo’s Nest and The Snake Pit. Based upon the author’s own experience after the birth of her son in 1924, The Shutter of Snow retains all the energy it had when first published in 1930. 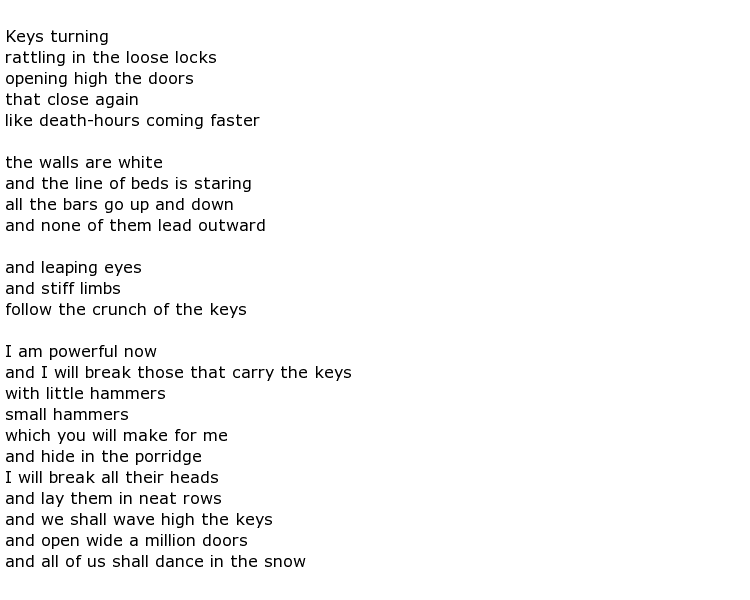 - excerpts from The Shutter of Snow by Emily Holmes Coleman, 1930. Although she published only one novel, The Shutter of Snow is remarkable in both subject and technique. Its author Emily Holmes Coleman is now unjustly forgotten. The novel's title originates in Coleman’s intuitive poetic conceit, likening "heat with destruction and cold with freedom” and draws on Coleman's experience after the birth of her son John in 1924. The novel's protagonist is Marthe Gail, a young mother unable to care for her baby, who is confined in a mental hospital when she begins to hear voices. Visits from Marthe's widowed father are occasions of emotional turmoil; his aggressiveness suffocates her. Frantic as she is to escape memories of their shared past, she retreats into silence. And yet, she needs to speak her mind to the important people in her life, her husband Christopher and her psychiatrist Dr. Brainerd. Marthe's struggle to regain a stable sense of self is reminiscent of another first person narrator in Charlotte Perkins Gilman's classic The Yellow Wallpaper (1892). Coleman found in writing, whether in novels and poems or in her voluminous diaries, a refuge where she was able to order her experiences and gradually take control of her life. For both Colemans, the move to France in 1925 came as a fresh start; Emily became the society editor for the Paris Tribune and Lloyd worked in advertising. Coleman began to publish her stories and poems in transition, a literary magazine where her work rubbed shoulders with that of Hart Crane and Kay Boyle. Founded in 1927 by the husband and wife team of Eugene and Maria Jolas. transition was a literary magazine devoted to experimental work in all the arts. Her novel The Shutter Of Snow got a negative reception when it was published in 1930. Coleman's modernist experiments, her use of shifting viewpoints and her subject matter made critics uneasy. They expressed annoyance at the lack of quotation marks to set off conversations, forgetting that these same techniques had been used by Jane Austen and Gustave Flaubert. Following the publication of The Shutter of Snow, Coleman lived for a year in St. Tropez where she worked with Emma Goldman, editing the anarchist's autobiography Living My Life (1931). She also became friends, albeit of a somewhat competitive and critical kind, with the heiress Peggy Guggenheim. Their friendship continued throughout the years that Guggenheim was engaged in assembling one of the major collections of modern art. Back in Paris, Coleman read the manuscript version of Nightwood by fellow. Djuna Barnes. Few people remember that it was Coleman who engineered the publication of Nightwood in 1936. Her skills at suggestion and persuasion worked so well that its editor T.S. Eliot and the general public believed its publication had been Eliot's idea. His enthusiasm for the book led him to call Nightwood "the best book written by a woman in the 20th century." The Shutter Of Snow should have been so lucky. Coleman returned to the United States in 1939 and in 1944 she converted to Catholicism, with the encouragement of her friends Jacques and Raissa Maritain. She became friends with Dorothy Day, founder of the Catholic Worker movement, and spent time in several of their communities. At the time of her death in June, 1974, Coleman was being cared for at Rose Hill, a Catholic Worker farm on the Hudson River in Tivoli, New York. Rough Draft: The Modernist Diaries of Emily Holmes Coleman, 1929-1937. Ed. by Elizabeth Podnieks, University of Delaware Press, 2012. 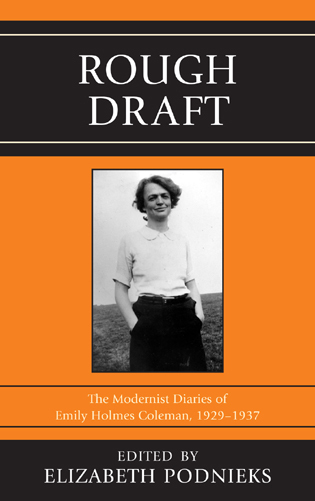 Rough Draft: The Modernist Diaries of Emily Holmes Coleman, 1929-1937 is an edited selection, published here for the first time, of the diaries kept by American poet and novelist Coleman during her years as an expatriate in the modernist hubs of France and England. During her time abroad, Coleman developed as a surrealist writer, publishing a novel, The Shutter of Snow, and poems in little magazines like transition. She also began her life’s work, her diary, which was sustained for over four decades. This portion of the diary is set against the cultural, social, and political milieu of the early twentieth century in the throes of industrialization, commercialization, and modernization. It showcases Coleman’s often larger-than-life, intense personality as she interacted with a multitude of literary, artistic, and intellectual figures of the period like Djuna Barnes, Peggy Guggenheim, Antonia White, John Holms, George Barker, Edwin Muir, Cyril Connolly, Arthur Waley, Humphrey Jennings, Dylan Thomas, and T.S. Eliot. The book offers Coleman’s lively, raw, and often iconoclastic account of her complex social network. The personal and professional encouragements, jealousies, and ambitions of her friends unfolded within a world of limitless sexual longing, supplies of alcohol, and aesthetic discussions. The diary documents the disparate ways Coleman celebrated, just as she consistently struggled to reconcile, her multiple identities as an artistic, intellectual, maternal, sexual, and spiritual woman. Rough Draft contributes to the growing modernist canon of life writings of both female and male participants whose autobiographies, memoirs, and diaries offer diverse accounts of the period, like Ernest Hemingway’s A Moveable Feast, Gertrude Stein’s The Autobiography of Alice B. Toklas, Sylvia Beach’s Shakespeare and Company, and Robert McAlmon and Kay Boyle’s Being Geniuses Together. Emily Holmes Coleman was an American-born poet, novelist and diarist of the 20th century who lived much of her life in France and England. In 1930 she wrote one remarkable novel called The Shutter of Snow which was the story of a woman incarcerated in a mental hospital. She used her own experience of being similarly confined as valuable research for the novel. She was born Emily Holmes on the 22nd January 1899 in Oakland, California. She was educated at Wellesley College, graduating in 1920, and within a year was married to a psychologist. The couple went to live in Paris in 1926, by now with a child in tow, and Emily found a position with the Paris Tribune magazine, the European edition of the Chicago paper. She was editor of the society columns. She was also a writer of poetry, short stories and articles which found their way into magazines such as transition. One of the things that she is best known for is an account of her time in Europe over many years written in a “Diary of an ex-patriate American” format, covering her experiences in both France and England from the 1920s to the 1940s. She had many friends and colleagues in the art and literary world over this time including the socialite and major art collector Peggy Guggenheim who invited her, and others of course, to regular meetings at her grand country house, Hayford Hall. This group of visitors became known as the “Hayford Hall Circle” and included the likes of Antonia White, Edwin Muir and John Holms. She was married for a second time to a rancher from Arizona but this lasted only from 1940-44 but this was disavowed following her religious conversion. From this time the church seemed to be her guiding light and she became much involved with the Catholic left wing. She took up residence in communities run by the church and was, at the time of her death, under the care of nuns at The Farm in Tivoli, New York. Emily Holmes Coleman died on the 13th June 1974 at the age of 75.